HUANUO HEIGHT ADJUSTABLE MONITOR STAND RISER, PERFECT COMPANION IN OFFICE & HOME! - HUANUO monitor stand can elevate your monitor up to 6.6" and the height can be adjusted to 3 different levels-4.35", 5.4" and 6.6", easily adjusting your monitor to an optimal viewing height. - HUANUO monitor stand is super easy to assemble and use. To adjust the height, you just need to add or remove leg segments. HUANUO adjustable monitor stand can hold up to 22lbs computer monitors, laptops, notebooks and printers. 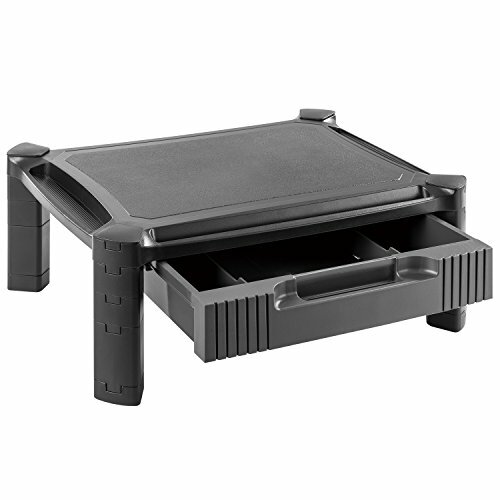 - HUANUO adjustable monitor stand comes with a secure pull-out drawer. You can put your papers, notebooks and documents in it and no one knows them if not pulled out. - On both side of the surface, there are two storage slot, you can put your pens, pencils and other small office supplies on it. Very convenient for working.